Antiseptic, antibacterial and clearing. 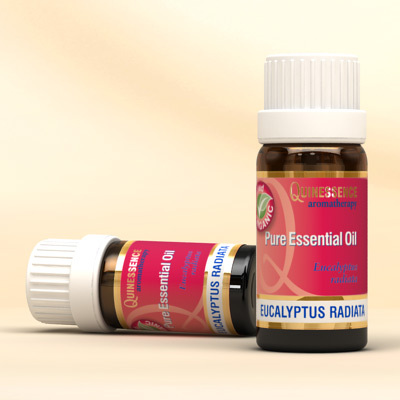 With a rich, crisp and slightly herbaceous aroma, this well balanced organic Eucalyptus Radiata Essential Oil from Australia provides a wide range of health-giving properties for aromatherapy treatments. Organic Eucalyptus Radiata Essential Oil is ideal in massage blends for easing general aches and pains, muscular fatigue, stiff joints, and as an effective pre or post sports rub. Like most species of Eucalyptus it has a powerful antibacterial, antifungal and anti-infectious action, which makes it extremely useful for defending against all types of infection. Many aromatherapists prefer to use this variety of Eucalyptus because of its softer, more herbaceous odour combined with its therapeutic power. This combination makes it better for inhalation treatments, and most especially when using it with young children. Organic Eucalyptus Radiata Oil has a decongestant action that loosens phlegm and unblocks sinuses gently and effectively.